The Bookmaker.eu site likes to think of itself as a classic site that is forging ahead in the brave new world of online gaming and gambling. With a tagline that runs when the “old school meets the new school”; players have every right to expect quite a lot from the site. The site delivers a strong focus on American sports but they do provide scope for sports in other countries and continents. The site is also more than just a sportsbook with casino, poker, horse racing and even mobile and tablet options on offer. The site looks good and it seems to make a positive first impression. It is important to not judge a site too quickly before you can see what it has to offer but on first glance, the Bookmaker.eu review is a positive one. The fact that the site places a great deal of importance on live betting options is to be commended. This is definitely what sports fans are looking for these days and the site offers more than enough options to keep people entertained and involved from start to end. With these live in-play options being available on computer, tablet and smartphone devices, there is an opportunity for sports fans to stay in touch with every moment of the game, no matter where they are. The site has a great selection of sports to choose from in their sportsbook including basketball, baseball, hockey, soccer, football, tennis, golf, motor racing, boxing, martial arts, cricket and surfing. The sportsbook also offers political bets if you have an interest in that sort of activity. With basketball being listed first on the site, it is only fair to check out the basketball options. This is likely to be a part of the Bookmaker.eu review that many people instantly turn to and at the time of checking, the site was fairly active on the basketball front. This was helped by the fact that the Eastern and Western Conference finals were taking place in the NBA but the site was fully focused on these games. These games were the focal point for most of the live in-play options that were being provided by the site but there was an opportunity to place bets in advance. The fact that Bookmaker.eu caters to the future markets in the NBA means that you can plan ahead and if you have a strong feeling about what is going to occur in the NBA Championship, there is an opportunity for you to put your money where your mouth is. 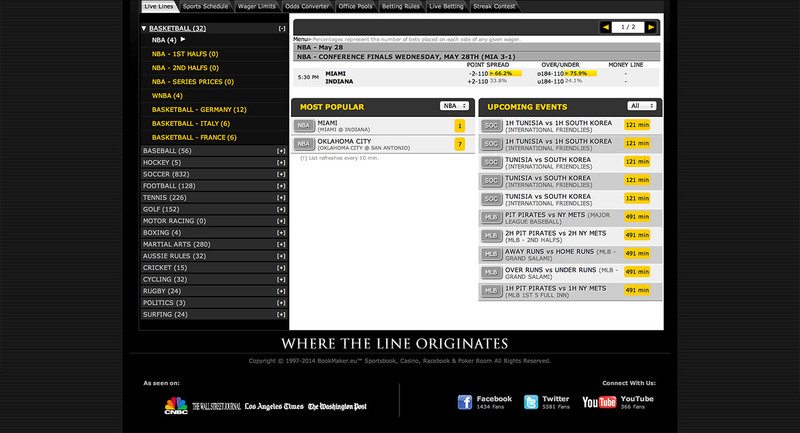 The sportsbook for NBA games offered 1st half bets, 2nd half bets and futures in addition to the live betting options. Alongside NBA, Bookmaker.eu offered basketball bets for the WNBA and a limited number of European basketball leagues. There are sportsbooks that provide a greater level of coverage for European basketball but you should find that the Bookmaker.eu site covers the most popular and important basketball leagues from outside the United States. One area where the Bookmaker.eu site is lacking, especially in comparison with some other US focused sportsbooks is with respect to statistics. There is no real level of focus on statistics or information about basketball or indeed any of the key sports covered by the site. There is no shortage of places where sports fans can find information about their favourite sports but it is of benefit to find basketball stats, trends and the latest form guides in the place where you wager. This is one area where the site could improve but it is not as if this is a make or break element when it comes to the site. However, the site does provide downloadable PDFs of the betting schedule for weeks and the month ahead, which is ideal if you want a handy record of the forthcoming games that you don’t need to access a betting site for. This means you can keep this convenient guide in work or at work and not have to worry about accessing a sportsbook site to have the important sporting dates at your fingertips. If you are not sure about sports betting or you don’t understand a lot of the terms, the site will help you out. There is an excellent and comprehensive glossary available on the Bookmaker.eu site, which will fill you with the most straightforward or most complex of bets. The site takes particular care to explain how Parlay bets work and there are a great number of Parlay options here. The site also offers a bonus section called the Streak where players can win money by tipping a run of winners. Another area where the Bookmaker.eu site is a great choice comes with the odds checker. This is a section of the site that allows you to compare fractional, decimal and American style odds to ensure that you are happy with the odds you have been given. When it comes to feeling confident that you are getting the best odds, the Bookmaker.eu site will ensure you feel confident. While the sportsbook section of the Bookmaker.eu site is enough for most people, there are other gaming and gambling options on offer. The site provides players with a separate horse racing section, ideal if you enjoy placing bets on the sport of kings. The site also offers casino and poker options for players and there are mobile and tablet options on offer for players as well. The mobile option even provides a video poker option so there is no shortage of gaming options provided by Bookmaker.eu. The fact that there is no separate live casino option is slightly disappointing, especially for a site that claims to be about the new school but on the whole, there should be more than enough gaming options to keep satisfied. US players will find that their deposit and withdrawal options are limited compared to players from around the world but there is still enough options for everyone to gain access to their account with funds. The full range of banking options provided by the site include VISA, Neteller, Click2Pay, Ukash, Eco, Person 2 Person, Bank draft and wire. 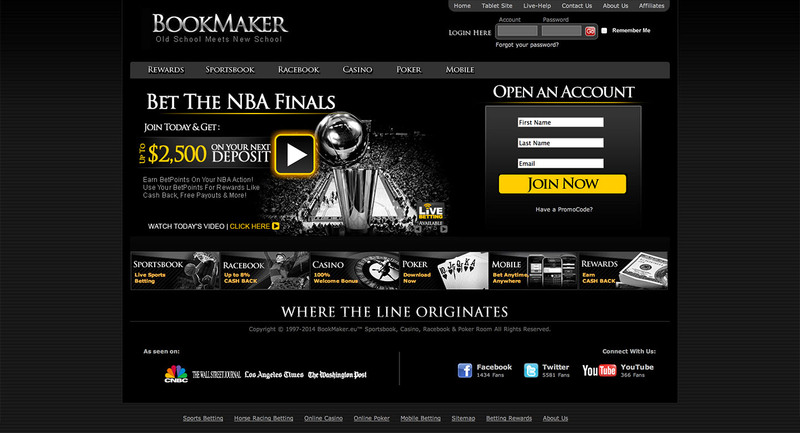 The Bookmaker.eu site looks great, responds well and provides a fantastic range of sportsbook and gaming options. If you are keen to find a strong all-round site, this is one that will not let you down.